In five locations across Missouri - and more than 300 locations nationally - rallies were held simultaneously on Aug. 22 to protest and raise awareness of abortion and the sale of aborted baby body parts...read more. State money was illegally used to facilitate abortions in Columbia while missing pathology reports on abortions in St. Louis raise concerns a fetal tissue trafficking...read more. Seventeen Lutheran Church Missouri Synod officials - the entire leadership of the Office of National Mission as well as the Synod's chief mission officer - issued a statement Aug. 20 denouncing Planned Parenthood's actions, recently showcased in another Center for Medical Progress video...read more. We see in these videos how Satan thrives on darkness and chaos, how he delights in baby boys and tiny girls picked apart with sterile utensils. And while we are repulsed and horrified, we no longer have the option to turn away...read more. While Planned Parenthood is the nation's largest abortion provider, having performed 327,653 abortions in 2013, federally qualified health centers (FQHCs), which operate in service sites in both rural and urban locations, offer low-income populations health services similar to those provided by Planned Parenthood, but do not perform abortions....read more. Click here for a comparison of Planned Parenthood and Federally Qualified Health Centers in the State of Missouri. Two leading pro-life organizations released a map today intended to showcase the thousands of community health care clinics that could step in for Planned Parenthood if it were to lose federal funding...read more. Drs. George Delgado and Matthew Harrison, who together have personally reversed chemical abortions for about a dozen women so far, are currently working on a second case-study article for medical journals. They plan to conduct a longitudinal study on APR in the future...read more. 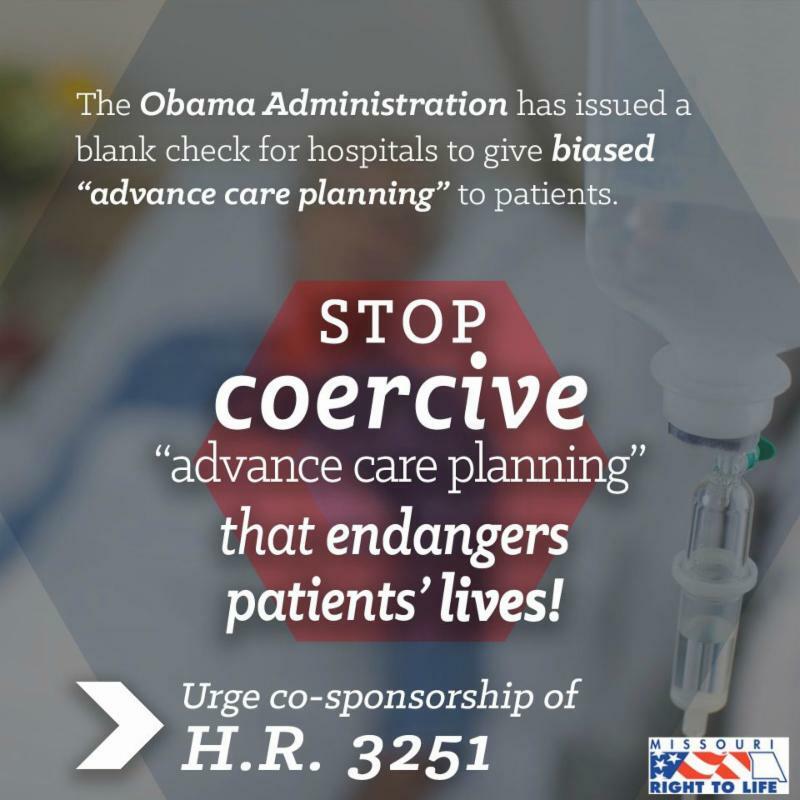 STOP Biased "advance care planning"
The Robert Powell Center for Medical Ethics at the National Right to Life Committee has recently sent out an action alert asking for you to urge your Representative to co-sponsor H.R. 3251, legislation to prevent the Administration from implementing new Medicare payments for "advance care planning" sessions, which substantial evidence shows are in most cases likely to "nudge" seniors to accept denial of life-preserving care and medically assisted provision of food and fluids...read more. September 3 - Springfield - Information and organization meeting for the MRL Springfield Metro Chapter. 7:00 - 8:00 pm. Springfield Library Center, 4653 S. Campbell, Springfield. Featured Speaker, Susan Klein, MRL Legislative Liaison. September 11 - O'Fallon - Fore Life Golf Tournament benefiting MRL Education Fund. Friday, September 11 at The Links at Dardenne, 7000 Brassel Dr., O'Fallon, MO. Click here for more info.